I’ve been all about the fast meals lately because I have been so crazy busy! I ate this salad for a late lunch after having a tall glass of juice. The juice was made of freshly juiced oranges and coconut water, and if you were wondering, it was amazing! 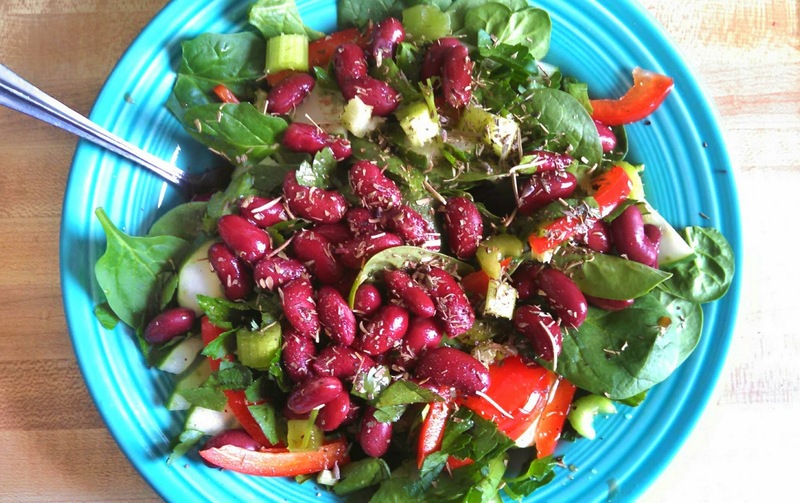 The formula for this salad is straight-forward: bed of greens, any combination of vegetables, beans, and herbs de provence dressing. There are always different theories on how to get past that afternoon slump: a nap, eat some protein (trail mix! ), carbs (carbs, carbs), light exercise/break from the computer. Well, I can say that I have had moderate success with all of these at different points in my life, but my go-to afternoon lift is most definitely greens. Juices and smoothies work well, but big salads are my preference. Sometimes I munch on my greens while I’m preparing the rest of the ingredients and can already feel some new energy circulating. -Prep your salad ingredients and arrange them in a bowl. -Whisk the dressing ingredients and pour over the salad.